They are close, but did you read that New York Times article about menu design a couple months back? Anyone following the trends for an upscale grill is going to end up with something similar. If either added a note of real character, it would do a lot to establish their own identity. They never shoulda done it: I find Lee Klein's review "Alta Comes Up Short" (December 13) so sad, especially since Vani Maharaj worked making salads for me at Michy's, never moved up or over, and Juan Mario Maza was one of my prep cooks, breaking down chicken and meat. I told them so many times they weren't ready to open their own place, and they of course had to prove themselves like so many young cooks today. The worst part is that they throw my name around without even asking for my acceptance or approval. If I were to open a Michy's South, you had better bet I would be there, and there would be more "seasoned" chefs on the line. I wish them luck, but they have to understand it takes more than working salads for less than a year to be a great chef. billjac - I've seen several menu design pieces recently, but that still only goes so far. It doesn't explain the color scheme and logo, for instance. Simply too many similarities to chalk up to coincidence or even just being informed by the same research. Irony is that there is a good amount of difference between many of the dishes at the new places, but 72nd doesn't seem inclined ot highlight those differences. Anonymous - thank you for that heads-up, I remember the Alta Cocina review but never saw Michelle Bernstein's letter. Quite elucidating, and a subject on which I'll be expanding on more generally soon. Here is a link to the letter at New Times. you guys should give this place a chance. regardless of the owners, the managers and staff are wonderful and the place has a really cool vibe. live music and funky art make for a younger crowd than town, which seems to be a bit dull lately. i think 72nd will be extremely successful and a fun place to hang out! After Reading the previous posts, I felt inclined to investigate this first hand. I needed only go to 72nd Bar + Grill as I already know Town well because I am a regular there. Upon arrival to 72nd, which by the way is 2 blocks from town, I immediately notice the identical etched logo design on the door. The color scheme at Town is dark wood tables with no table cloths, a square white napkin in center with a fork and a knife to left and right of napkin. Set up at 72nd is identical. Town paint scheme is white walls with dark wood and orange highlights. 72nd grill is identical. 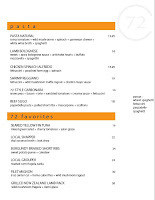 As I peruse the menu the menu items and categories are quite similar but more than anything, the layout is identical. Only difference is the put a background color instead of white paper. The wine menu is almost identical in nature as well in how its laid out. As far as service, I was not impressed. Now I'm all about giving new places a chance and I did. This may just be the fact that its new and they are going through growing pains. Hopefully they can get it right and if they do best of luck, but you will only be finding me at the "Original" neighborhood joint of Town Kitchen & Bar. Call it loyalty, but I favor good, friendly and timely service. I enjoyed the food at Alta Cocina so I'm glad that Juan Maza took the time to clear things with Town and with others who found the similarities unsettling. I'm looking forward to stopping in on my next trip to South Miami to check them out. That's gotta be one of the classiest feud quelling comment I've ever read. Congratulations Mr. Maza, I hope you can be used as an example in future 'online reputation management' courses. To clear the air, Mr. Maza has not contacted or spoken to me about the issue of him coping the Town logo style, color scheme or menu. We are all nice people and anyone going into the restaurant business takes big risk. This is all the more reason for one to try to diferrentiate themselves from others, especially in their direct market.